If you are planning on remodeling the bathroom in your home in the Des Moines, Iowa, area, it’s important to trust an experienced company to handle the job. You don’t want to hire a company to later find out that they aren’t prepared to handle the renovation for you. Hiring an inexperienced business to remodel your bathroom for you can even result in damage to your home. In order to avoid the headaches that could come with hiring unskilled technicians, ensure the business you decide to hire uses factory-trained installers. When you are remodeling your bathroom and spending a good deal of money, you’ll feel better about your investment knowing that the technicians completing your installations are familiar with the products. For top-of-the-line products and expert installation services for your home in the Des Moines, Iowa, area, look no further than U.S. Patio Systems and Home Remodeling. Our trained and certified technicians can expertly complete your bathroom remodeling project for you and provide a pleasant experience along the way. 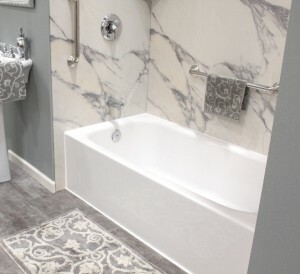 From flooring, to replacing bathtubs, our specialists can do it all. We even sell and install specialized products like walk-in tubs. These bathtubs from Safe Step Walk-In Tub Co., are great options for those with limited mobility. Never again will you have to worry about slipping and falling while entering or exiting the tub. Our walk-in tubs also include a number of other fantastic features, including wide doors, quick-release drains, sanitary surface coating, easy-to-reach controls, anti-scald technology, and more. If you would like to learn more about remodeling the bathroom in your home in the Des Moines, Iowa, area, contact U.S. Patio Systems and Home Remodeling today. Our specialists are available to answer any questions you have.